Clemson defensive end Vic Beasley earned first-team All-ACC honors by recording the nation's fourth-most sacks (12) and seventh-most tackles for a loss (19). 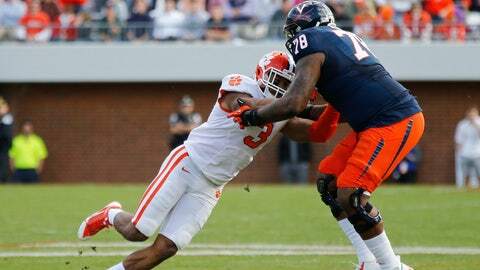 FORT LAUDERDALE, Fla. — Clemson junior linebacker Stephone Anthony would like nothing more than to move on from Jan. 4, 2012. That’s when West Virginia orchestrated a record-breaking offensive performance to rout the Tigers 70-33 in the Discover Orange Bowl. Quarterback Geno Smith threw for six touchdowns, Tavon Austin had four TD catches and the Mountaineers set the all-time bowl record for points. "I’m pretty sure not many people on our team are still thinking about it," said Anthony, who leads Clemson with 120 tackles. "We’d like to get that taste out of our mouths." The 12th-ranked Tigers (10-2) will get their shot at redemption against No. 7 Ohio State (12-1) Friday night at Sun Life Stadium. Only two defensive players from the current team — graduate linebacker Spencer Shuey and senior linebacker Quandon Christian — started in that previous trip to South Florida. Redshirt junior defensive end Vic Beasley, who earned first-team All-ACC honors by recording the nation’s fourth-most sacks (12) and seventh-most tackles for a loss (19), credits the senior leadership for the program’s growth and maturity. "The way we gravitate to our seniors and how they lead us has been a big change over the past two years," said Beasley, who didn’t play in the ’12 Orange Bowl. "We gained a lot of experience losing very badly two years ago. We’re going to come into this game and we’re going to have a better outcome." Coordinator Brent Venables was hired a few weeks after the defeat and promised that defensive performance would never happen again. He had spent the previous 13 years at Oklahoma. Many people have predicted a high-scoring game on Friday because both teams average more than 40 points per game. It’s an assumption that Venables doesn’t appreciate. His unit ranks 23rd in total defense (351.1 yards per game) and 17th in scoring (21.1). "I don’t like that one bit," Venables said. "It doesn’t matter if it’s Ohio State, Pittsburgh Steelers. It doesn’t matter. Your job on defense is to stop people. Everybody wants to say it’s a shootout. You take offense to that. But that’s not just this game. "You play in a high-powered offense and in today’s age of football whether it’s the NFL or in college they’re offensive-driven and the rules set it up for them to have an advantage per se. We know we have a great challenge on Friday night, but weâre not playing on defense, ‘Let’s just get one more stop.’ That’s not how we operate no matter who we’re playing." Anthony knows the unit must stop the run and create turnovers to prevent deja vu. The defense has taken pride in those two points of emphasis this season. The Tigers have tallied 33 sacks and 15 interceptions in 2013. Another key for Clemson will be limiting junior quarterback Braxton Miller, who poses a threat through the air and on the ground. Miller has thrown for 1,860 yards, 22 touchdowns and five interceptions in 11 games and has run for 1,033 yards and 10 scores. The Buckeyes boast the nation’s third-best rushing attack (317.5 ypg) and a top-10 passing-efficiency rating (158.8). They have produced 87 big plays and hold the fourth-best red-zone offense (95%). "It’s going to take all 11 guys on defense," said Shuey, who made third team All-ACC with 110 tackles. "Every time they drop back you’ve got to take into consideration him taking off scrambling. It’s definitely going to be a challenge. It’s definitely going to take the whole defense." Clemson doesn’t need to look back 364 days for motivation when it takes the same field under the same lights Friday night. Not after falling to in-state rival South Carolina to conclude the regular season. Junior defensive tackle Grady Jarrett sees the opportunity against the Buckeyes as more than a second chance, rather a fresh start. "We’re focused on this game," Garrett said. "Us being down here two years ago has nothing to do with this year. This’ll be our first game in 2014, so we want to start the year right. "Everything is in the past. We came so far in two years as a whole team. We’re just looking forward to starting 2014 right."